Konecranes is a heavy-duty specialist, expertly serving a wide range of industries since 1959. 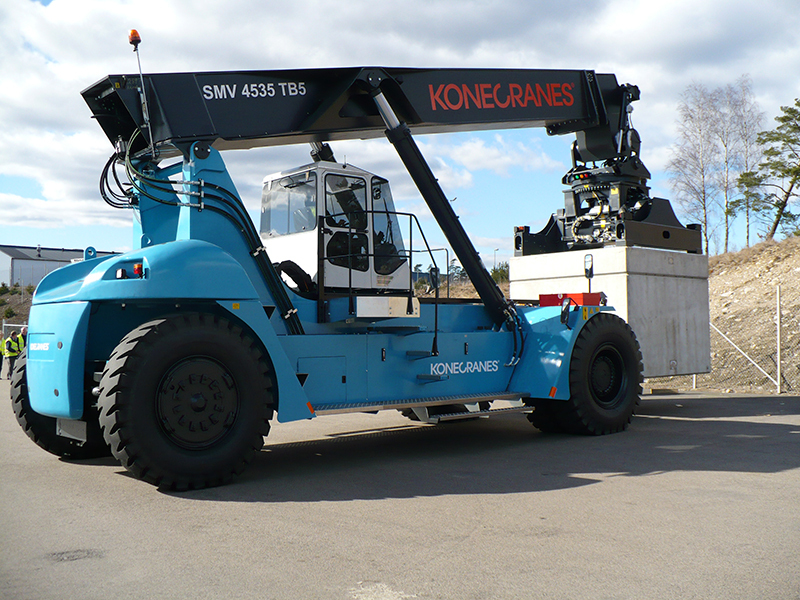 From ports, terminals and steel manufacturing to rail freight and concrete, Konecranes offer a wide range of lift trucks which can be specifically tailored to meet the demands of your specific application. Konecranes offer the widest and deepest range of premium lift trucks for container handling on the market. 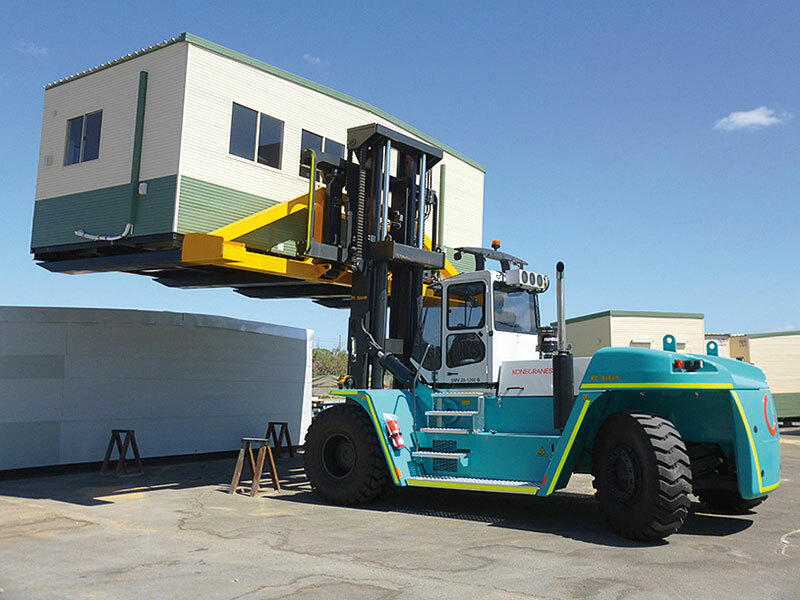 Specialised equipment includes container lift trucks which are more cost effecitive and perfect when space is limited. The alternative is the impressive Konecranes Reach Stacker. Quick, flexible and work in rows by stacking in pyramid shape, the robust truck optimizes the working area of the terminal. 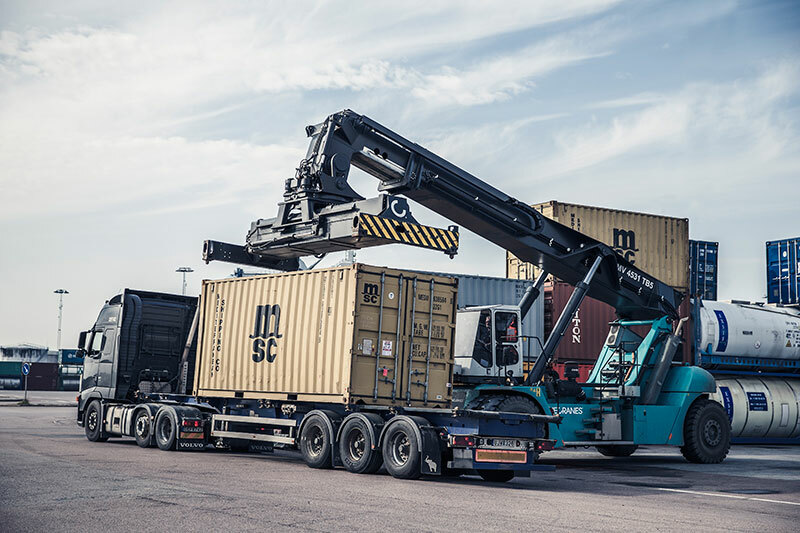 Should you be a transport and logistics company operating a container terminal or warehousing operation, then Konecranes offers an excellent range of heavy-duty fork lift trucks and special attachments. With lifting capacities of up to 65 tons you can your deliveries of goods on the move. We understand no two steel mills or aluminium production facilities are alike and requires a truck that is specially adapted for their intended roles. With excellent manoeuvrability, Konecranes fork lift trucks are designed to quickly and efficiently move steel and aluminium products to the end user. 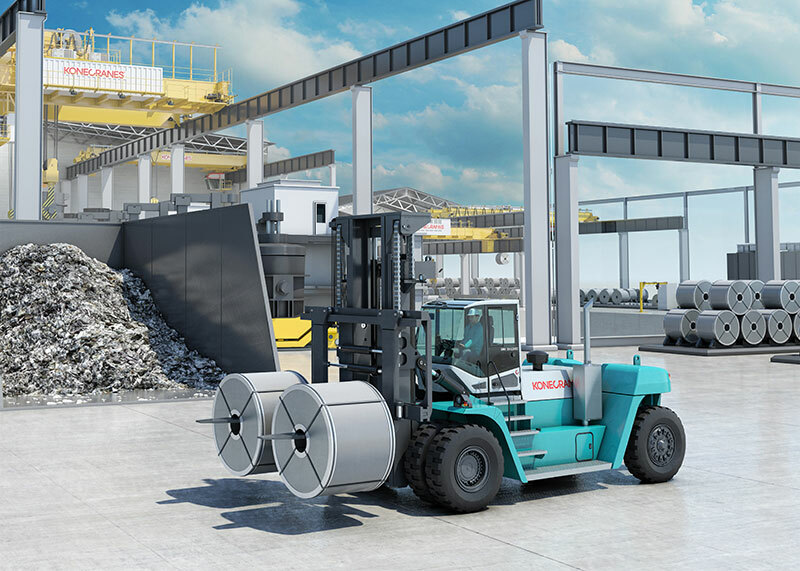 Should the application be unique in size and shape then Konecranes reach stackers provide the ideal solution for moving heavy steel or aluminium products around warehouses, especially when space is limited. Designed for the most challenging industrial handling applications, they can carry even the heaviest applications, up to 80 tonnes. Heavy apparatuses need to be handled at various phases of the manufacture, delivery and erection of a wind turbine. Konecranes fork lift trucks and reach stackers have the ability to lift 10 – 80 tons and provide all the special attachments needed. From lifting offshore wind turbine foundations, tower sections, blades and/or nacelles, our special attachments are ideal for the various stages of constructing a wind turbine. Konescranes specialise in offering tough and durable forkift trucks for handling concrete, brick and rock within a number of working environments including quarries, factories, intermediate shipping sites and ports. The unique strength and power of their fork lift trucks makes them reliable and safe to work on. With a complete range of fork lift trucks, lifting masts and forkshaft systems available for concrete, brick and rock handling applications – there are with great scope for special adaptations where needed. Konecranes is the leading global supplier of lifting equipment to the nuclear power industry. They provide a complete range of heavy duty lifting equipment, including their robust Reach Stackers and Fork Lift Trucks which have been designed to work with various applications in the nuclear power production process. Konecranes Reach Stackers can handle 45 ton over packs and the heavy-duty fork lift trucks can handle general cargo weighing up to 65 tons, and standard 20 foot containers. From a small workshop containing two people to enormous factories producing tens of thousands of units per day, Konecranes have years’ experience in supplying lifting equipment to manufacturers. Konecranes specialise in light manufacturing, where they are able to offer a range of overhead lifting systems that are adaptable to your production line. With the ability to lift up to 65 tons and an extensive suite of attachments, Konecranes are also geared up for heavy manufacturing. 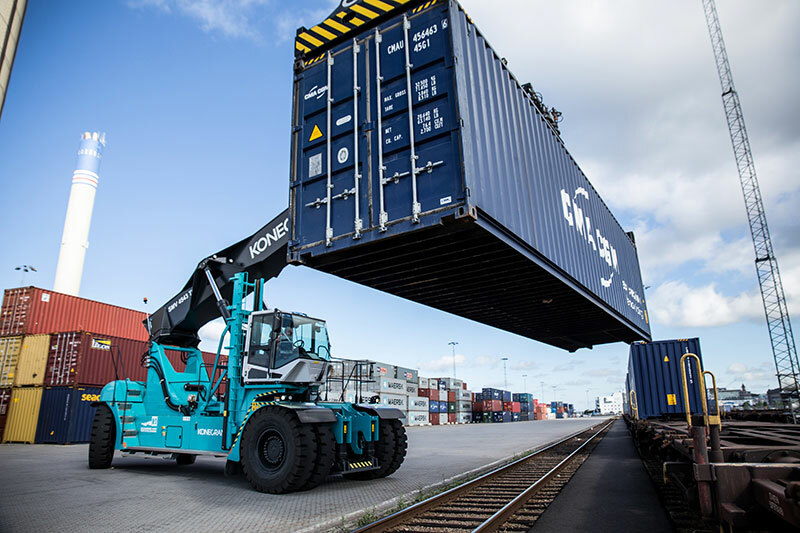 Rail track provide a huge advantage for logistics, and Konecranes offers a range of lift trucks to help you exploit this opportunity. 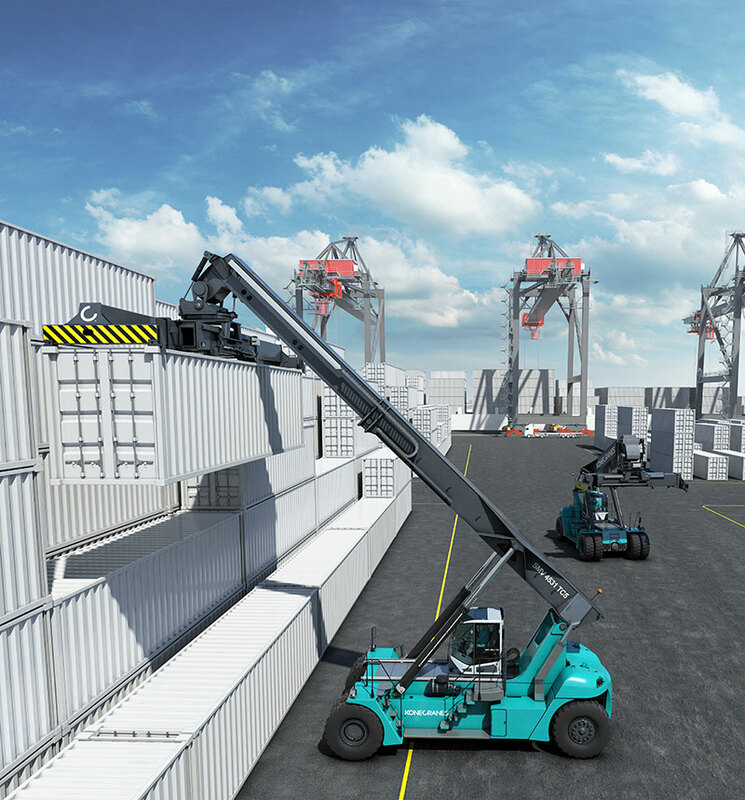 A popular solution is the technologically advanced Konecranes Reach Stacker which can handle 1 or 2 rails, various sorts of cargo or load Lorries in one movement. 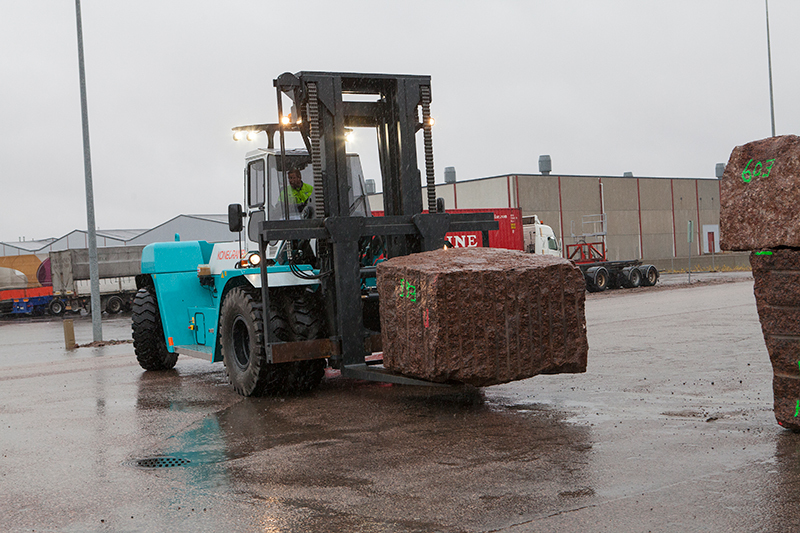 Konecranes Lift Trucks are the only heavy handling distributor that offers full capacity at prolonged load centres. Container handlers also gives you the opportunity charge or discharge trains and handle heavy objects on the terminal. This type of truck is preferred when there’s no limitation in available terminal space. 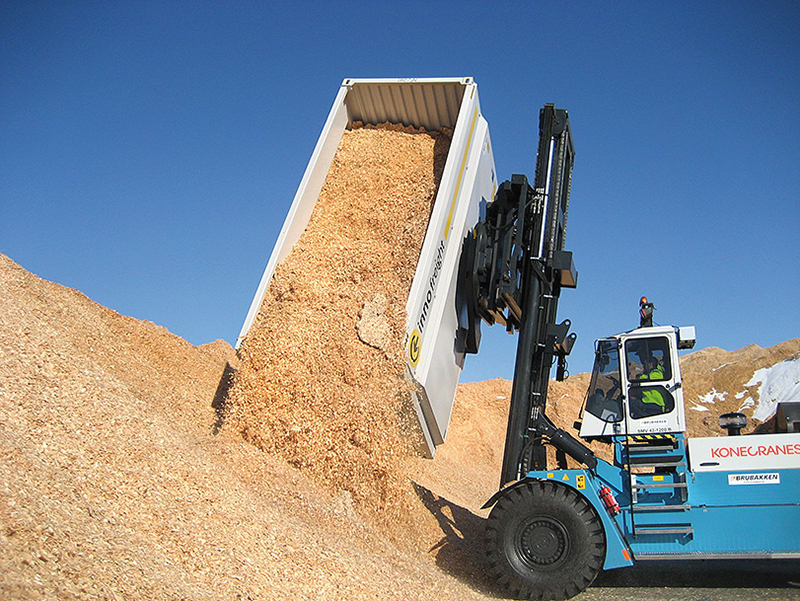 Empty container handlers allow stacking of empty containers up to 8 high, with single or double stacking. Konecranes is seen a key supplier of lifting equipment to the oil and gas industry, with special knowledge of the lifting requirements involved in many parts of the production process. 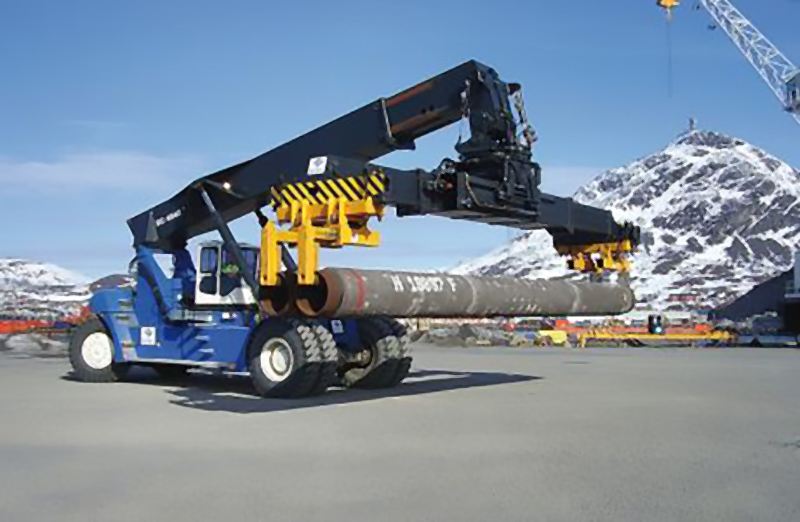 Whether you require a reach stacker to handle several pipes or a fork lift truck to handle long pipes or special tank containers, their lift trucks boast a wide range of oil and gas material handling applications along with special attachments. Turning waste into energy is a multi-staged process which needs to be managed properly in order to operate efficiently. 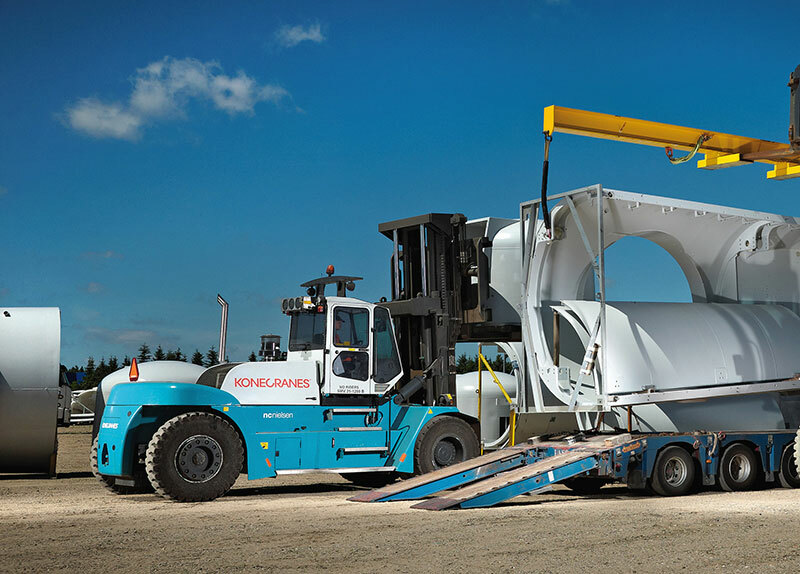 Konecranes provides fast, safe and reliable lifting solutions designed to meet the demands of this long process, including a wide range lift trucks and special attachments. Whether you are looking for a forklift with a 360-degree rotation unit, or a reach stacker with a 45-degree side tilt to empty waste containers, we are able to customise our solutions to meet your requirements.